The new Fortnite update, Patch 8.30, introduces a new system that allows you to revive dead squad members. They’re called Reboot Vans, and the update puts them in all major POIs. There’s a whole mechanic behind this, involving picking up Reboot Cards left by slain squad mates and taking them to the Reboot Van locations. Also, the new update brings the Buccaneer’s Bounty Event to Fortnite. 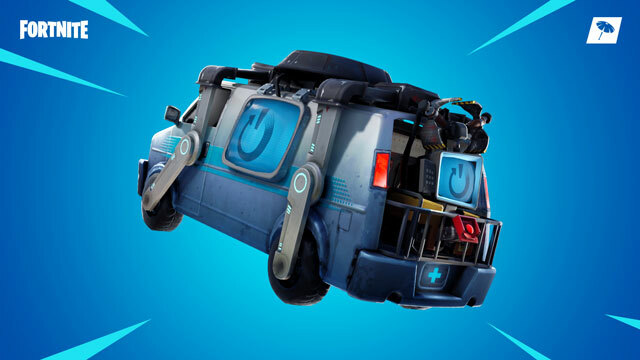 Reboot Vans are basically a respawn function, similar to what Apex Legends does. As such, it won’t be available in “Solos, Big Team Limited Time Modes, and any modes with respawns enabled.” They will be added to “all major POIs.” How exactly do these Reboot Vans work? Well, when a squad member dies, they’ll drop a Reboot Card. This card will remain in the world for 90 seconds. All you have to do is pick it up and take it to the nearest convenient Reboot Van location. Any squad member can turn in a Reboot Card, no matter who actually picked it up. It takes 10 seconds to do this. Your squad mate will come back with 100% health, one Common Pistol, 36 Light Ammo, and 100 Wood. The Reboot Van station will then go on cooldown for 120 seconds. Another interesting addition to the game is the Buccaneer’s Bounty Event. Apparently, a different Limited Time Mode will “rotate in every day from April 10 – April 15.” You’ll be able to drop in and complete free challenges, and earn in-game rewards. During the event, spawn rates of Treasure Maps will be increased. So, yeah, there is, as usual, a bunch of fresh, interesting stuff to do in Fortnite. Now, of course, the new update also introduces a whole ton of various bug fixes and other improvements to the game. We’re not going to list them all here, as the list is truly massive. If you want to take a look at it, you can check out the full patch notes for Update 8.30 on the Fortnite website.